Albania is redolent with ancient treasures. Regular CWA readers will be familiar with the stunning archaeology at Butrint, but the country offers much more: from Rozafa Castle, stronghold of the powerful Bushatli Pashas at Shkodra in the north, to the Medieval city of Berat. Here, Christians lived in the mountaintop citadel with its wonderful Byzantine churches, and Muslims held the great commercial quarter at the bottom by the River Ossum. Then there is Antigoneia, overlooking the wide Drinos valley, founded by King Pyrrhus of Epirus and named after his wife, but destroyed barely 200 years later by the Roman Consul Amelius Paullus. One of the most evocative regions is the borderland of Pyrrhus’ kingdom: the long winding strand of the mighty River Vjosa, which rises in northern Greece (where it is known by its ancient name, the Aoos). After crossing the long mountain valley of Permet and turning through the spectacular Kelcyra Gorge – known in Antiquity as the Gates of Antigoneia, where the Consul Titus Flamininus first engaged the Macedonian army under King Philip V – the river passes the town of Tepelena, home of the notorious Ali Pasha, who Byron visited and then included in his poem Childe Harold’s Pilgrimage. It continues through the southern mountains towards the sea, skirting the Illyrian mountain cities of Byllis and Amantia, and finally reaching the Adriatic close to the powerful Corinthian Greek colony of Apollonia. This line was the traditional northern frontier of Epirus, the small state that strode so large on the stage of the ancient world. Pyrrhus and his predecessors ruled an odd agglomeration of tribal groups in the ancient regions of Thesprotia, Molossia, and Caonia – more of a federal union than an absolute kingdom. After the monarchy failed in 231 BC, it became a Republican League. And, while the identity of ancient Epirus is today a political hot potato between Albanians and Greeks (as though 2,000-year-old tribes really contribute much to modern political discourse), there is little doubt in my mind that the state was really neither Hellenic nor Illyrian, but rather a unique filter through which the two interacted. The monastery of St Mary at Apollonia. The final part of this long natural frontier is both fascinating and beautiful. A brand new motorway along the valley linking Tepelena with Apollonia makes access easy, and reflects the way the river valley served as a vital artery to the interior in Antiquity. This, and the highland paths to north and south, was one of the principal routes along which invading armies marched, and through which flowed the trade that enriched Apollonia, the greatest of Albania’s ancient cities. Apollonia was a Corinthian foundation, established in 588 BC as part of the great surge of Greek colonisation in the 7th to 6th centuries BC. The Ionian and Adriatic Seas became little more than a Corinthian-dominated lake, where other Greek cities got little look-in. Apollonia quickly overawed or defeated other colonies – Illyrian-Epirot cities such as Orikum, Avlona, Olympia, and Thronium – to secure the resources and slaves that made it so wealthy. Like Epidamnos, its sister city to the north (later famed as Roman Dyracchium), Apollonia maintained close relations with the tribes of the interior, and was, for a while, ruled by Illyrian kings. Ultimately, it was the chosen disembarkation point for Roman armies campaigning against Macedon, and the terminus of the earlier and southerly branch of the great trans- Balkan Via Egnatia. The lower reaches and estuary of the Vjosa passed close to the city, and developed as an extensive port facility offering safe anchorage and trans-shipment. Apollonia today is a series of bald hills, similar to the windswept site described by the English traveller Edward Lear in the 1840s. Excavated by successive French archaeological missions dating back to the time of Napoleon III, a good chunk of this huge site is now visible. Recent excavations in the necropolis make it clear that an indigenous settlement existed in the 8th century BC, incorporated into the colony in Classic Greek style. The urban centre is dominated by stoae and agorae – spaces that would have housed the famous schools of rhetoric attended by the young Octavian before his adoptive father Caesar’s murder – and the Roman-era council chamber and odeon. Recent excavations at the sizable Greek-style theatre have revealed that it was almost entirely rebuilt in the 2nd century AD, perhaps as a hybrid theatre-amphitheatre. A short distance beyond the now largely vanished city walls is the lonely hill of Shtyllas, where a single Doric column of the largest Greek-style temple of the region still overlooks the ancient course of the river that brought prosperity to the town. The shifting of the River Vjosa in the 3rd century AD doomed Apollonia as a great city. 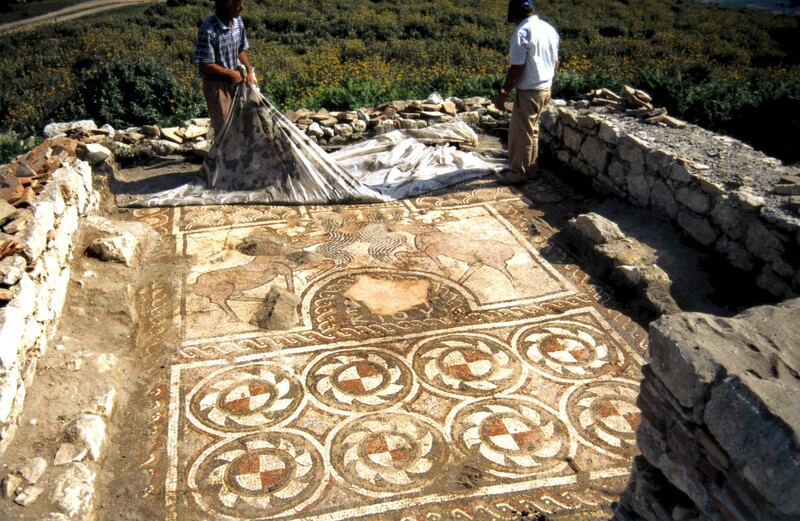 Deprived of its trade, it shrivelled and died, though the typical hodge-podge of rough constructions of Late Antiquity have been found by recent Franco-Albanian excavations, including a basilica with a figured mosaic floor of the 6th century AD. Its later successor is the very fine 13th-century monastery, where Lear passed a draughty night. A Byzantine church stands in the centre, with many Western-seeming features typical of these coastal regions, and the very last ‘Roman’ triumphal monument on the Adriatic: a fresco of the Emperor Andronicus II and his father Michael VIII. The nearby refectory has three levels of fresco painting, also dating back to the 13th century; and in the upper galleries, the visitor will find the newly restored museum, back in action after a 20-year hiatus. In many ways, though, the real treasure of the Vjosa is Byllis, an Illyrian city some 30km (20 miles) inland, near the town of Ballsh. Byllis was founded in the 6th or 7th centuries BC by a migration from the smaller city of Nikeia, down in the valley. The whole mountaintop was fortified, and made into a tribal centre for the Bylliones. Its rival Amantia – less easy to visit today but with a finely preserved stadium – scowls across at it from the southern side of the valley. The staggering view, with the river cascading away through the valleys and a glimpse of the blue of the Adriatic in the distance, make Byllis one of the most appealing ancient sites in the Balkans. Although the city was first identified in the 19th century, excavations here since the 1980s have uncovered an amazing series of buildings. Byllis adopted a fully Hellenised regular street-plan and buildings. Tribal ritual demanded space for large gatherings, so a good quarter of the walled city was taken up by two agorae, a large stadium, and a substantial theatre. Peristyle houses provided accommodation for the wealthy, and a large empty quarter remained for tribal refuge in time of war. The majority of the population lived in the tribal hinterland. Julius Caesar made the city a colony, and a number of its citizens left their mark in the Roman period. One, Marcus Valerius, a local boy made good and veteran of Emperor Trajan’s campaign in Mesopotamia, proudly recorded his command of a sizable chunk of the Roman army and his building of roads and bridges in this rocky region: ‘he built a road from the colony of the Bylliones through Astacia, and though the way was narrow, rough and dangerous, he paved it with the result that it may be travelled by wheeled traffic…’ foreshadowing the new motorway! But the archaeological icing on the cake is the transformation of the city in the 6th century: the local governor Victorinus, a troubleshooter who served successfully on the Danube, rebuilt the town at the behest of Emperor Justinian after damage incurred by barbarian incursions. Demolishing the ancient structures, Victorinus burned down the stone for lime, and erected a new wall circuit around barely a quarter of the original city’s extent. Two building inscriptions noted his efforts to revitalise the city, and certainly this was no idle boast. Excavations reveal that the ancient porticoes and peristyle houses were rebuilt in splendid Late Antique style, much as at Apollonia, while no less than five basilican churches with mosaic pavements were erected by private patrons, probably attached to their elite residences. 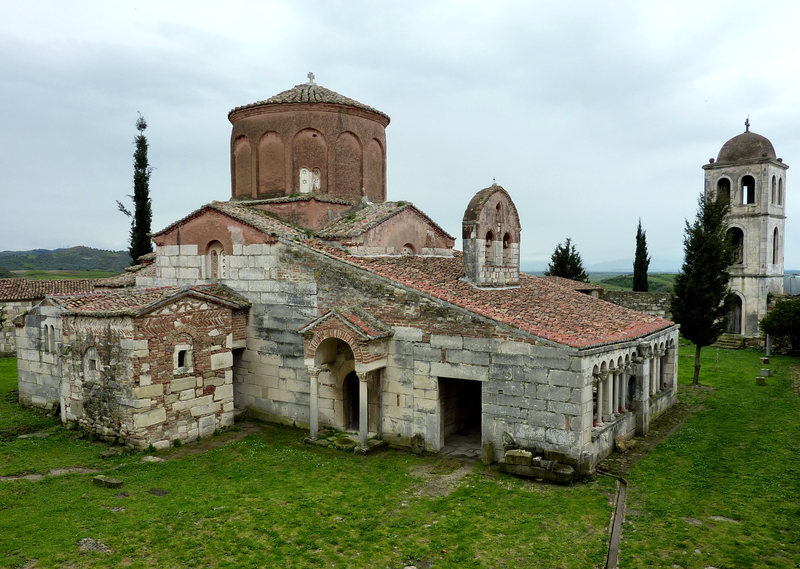 One of these was the episcopal cathedral – though the bishopric was later moved to Ballsh and, ultimately, to Berat. In short, Byllis is a model Late Antique town, representative of that strange time when the Classical world was becoming the Middle Ages. A visit can be ended at the little bar and restaurant, whose owner, Beqo, produces a wonderful slow-cooked lamb. He is really a representative of the energy of the new Albania. Having begun with a concrete box, he is now the host of a pleasant establishment built not for the archaeological site but for the adjacent shrine of the Bektashi Dervish Saint Father Haziz. On his feast days and for some school graduations, the site is crowded; but at other times, visitors to this sublime place are accompanied only by the wind and the grand panorama of river and mountains.